Celebrities hunt for antiques across the UK. Top Paralympians Tanni Grey-Thompson and Jade Jones do battle in the north east of England. Browse content similar to Tanni Grey-Thompson and Jade Jones. Check below for episodes and series from the same categories and more! -I do that in slow-mo. of our finest Paralympians under starters' orders. It's not about the competing. It's about the taking part. Of course not. Absolutely. Yeah! -I definitely don't want to win! and her young protege Jade Jones. when it comes to this malarkey. Do you know what sort of things you want to buy? of jewellery or something like that, maybe. -I really like glass things. But I just don't want to buy junk and pay a lot for it. picking up her final Olympic gongs in Athens in 2004. I could be quite rude and say your medals are pretty much antique! whilst also training young Jade. It's a shame we never really got to race against each other. -It's going to be a bit weird competing. -I think it'll be fun. and not into sport one little bit. At first I was like, "I'm not sure if I really want to do this." and there was another guy there that was off to the Paralympics. competing in her first Olympics in London in 2012, and then Rio. Have you seen the tape deck in it? I don't think I've ever listened to a tape! Really? We've probably got some tapes from probably the early '80s. So what's the oldest music you've listened to? Smells like antiques experts David Harper and Phil Serrell. Here we are. Now, entertain us. in the north-east, isn't there? -You've got all the footy. -Wor Jackie - was it Wor Jackie? -He was Newcastle legend Jackie Milburn, actually. should just concentrate on doing their thing. Starting out with an assignation in Hartlepool. Puts you on the map, I suppose. -I'm good, thank you. How are you? Yeah. This is my car now. This is it. I think somebody's very local to here, aren't you? We probably know all the good shops. We're just going to slope off now, if that's all right? -Bear with us. We'll have to get your equipment out. -That's amazing, actually, isn't it? Right. We're in the modern, trendy, young, funky TVR. -You two in the old grand tourer. -Oh, he's revving his engine. Bye! before pushing south to a Yorkshire auction at Harrogate. Now, not sure they know it yet, but they're in the first shop together. -There they are. For goodness' sake. Which direction have they come from? Quickly, let's go. Jade is really good at shopping. -You go in, I'll let her tyres down. There're racing, they're trying to get in before us. Can't believe it. a march somewhere. We're the old-timers in this thing. At least we have a neutral Kiwi proprietor to ensure fair play. -How are you doing, guys? All right? Sweet, I'd say, Alan, with a chocka place like yours to explore! Have you ever been into a shop like this before? Never. Is that a hot water bottle? How did you spot that? You've got blinking good guys, haven't you! -Tanni loves a good hot water bottle. as Tanni and Phil have already discovered. How would you have got on in Seoul with that? Actually, my first racing chair was probably not far off that. -We've got some leaded lights. See, I do like this coloured glass. -You like glass, don't you? -I do like glass, yes. -Shall we take this one out and have a look at it? when this breaks, it's an absolute pig to repair. -Yeah. I do like the colours. -Come on, Phil, get rummaging! -What about that one, boss? They said she was easy to work with. Oh, that's nice. Oh, I like that. Isn't that lovely? There is some damage down the bottom. I like the colours on it. I want to make sure the others don't see them. I've played with David Harper before, let me tell you. There we are. Right, swiftly moving on. to buy a moose head and now a buckskin. -Is it a proper cowboy outfit? I'm not sure if it's for me. -Would it suit you? Let's have a look? -I don't think it's my style. -Now, there's a funky chair. Do you like that? The cupboards, I quite like the cupboards on the side. Look at that! Shouldn't every chair have cupboards? Every chair should have cupboards. So, what you got here, you've got zones for bottles. -So you could have bottles of beer. Whiskey, whatever you like it. This will recline, I'm sure. Oh, really? Oh, wow, OK.
And then we have little magazine racks this side. -What dates do you think it comes from? What period? Look at the shape and the design of the arms. -Does that remind you of old cinemas? -It's got that early sort of Art Deco feel to it. it would have been in a leather or may be what they call a moquette. Jade, would you have this in your house? Do you know what, I think I would. It's quite quirky, it's a bit different. Different is good. And in this business, different is brilliant. Well, let's find out if the price is just as easy. -Well, you're bound to say that, aren't you? -I do, I love it. -What sort of money is it to the lovely Jade here? I can do it for about 50 quid if it's any good to you? Now, Alan here is used to serious negotiators coming in here. Is it worth us working very hard on the lovely Alan? -Maybe 45 is going to buy it, I think. OK. We'll do it for 40, then. -You are an absolute natural. You've just done a deal, your first deal! Shake his hand. Brilliant. a wee bit more industrial in mind. I'd definitely have that as a tool box. I've got enough tools to fill it. -Do you think people would buy it? -I'm bang on trend, up there with the kids. That's where I am. Down there with the kids? See, I'm not up there, I'm down there. I've even got that wrong. -You'd sort of kind of just strip that. -What's it made out of? Crikey, don't get your hopes up, Alan. -Oh, my gosh, what have we found here? -Of all the places that we've been. Let's rewind. Tanni, it's not great. And then of course there's the windows. How much will he want to take these of his hands? -What, him to pay us? They really do want to win, don't they? -That's really killing me, that. That's what we were sort of thinking. -Well, I was thinking 20 quid. -15 quid, you've got a deal for the two. We've got to go have a look inside. because your other customers could be calling any minute. -Here, have a look at one. -So that what drew you in. you get the tiny little cups and saucers and things. is very much about that, it's about memories. -They're made by a company called Goss. of the 20th century. All novelty miniature pieces. -And often from different places. -There you go, there's Skegness. you would buy them from Hartlepool. -..100 quid, 150, 15 years ago. They're probably not worth much more than ten quid. But the thing is, it's going to auction and it would make a good auction lot. -Yeah, it might. Oh, Alan! Can we get 15 quid for the lot? Jeez, that's a good deal. Well, let's see how many pieces we've got. Can't even be bothered to count. More than ten pieces. Oh, we get the tray as well? -The tray's probably worth more, actually. -I think we all heard that whisper! OK, so you said 15. GEORDIE ACCENT: Shy bairns get nowt. -Make it a tenner and we've got a deal. That's great. Time to pay the man £50 for the china and the chair. will Tanni and Phil acquire anything else? Up with the kids, then, eh, Phil? -No, that might be, though. "Persons are warned not to trespass on the railway. "to a penalty of 40 shillings." -Was that a lot of money? No price label on it, either. like that is massively collectable. -Do you want to see how much it is? -Shall I go and see if I can find Alan? because I live in the north-east but I work in London. I like the North Eastern Railway bit, I think that's fantastic. You could clean that up and it would look really nice. Time for the north-east's premier Antipodean antiques vendor. Well, I was thinking like 40 or 50 quid. Oh, my God. It's not mine, it's somebody else's. -I can get him on the phone. Is there a chance, do you think? Or are we wasting our time? Might be a chance. Might be a chance. -It's a big ask, Phil. -Can I offer you 60 quid for it? £60. Oh, you're an absolute star. Let me just... I'll go and tell Tanni. It's her decision at the end of the day, but thank you so much. -he said we can have it for 60 quid. I think we should buy that, don't you? They seem to have got an awful lot for their £75. -80. Fiver change. Thank you. -A cabinet, two windows, and of course that sign. Come on then, Tanni. Off we go. Onto the next, onto the next. Time to discover the whereabouts of Jade and David. how your life was changed from that one meeting with Tanni? and that moment just changed everything. What's the ultimate goal, aim for you? "Oh, gold medal at the Paralympics or Olympics,"
I will know that's kind of it. I think that's a very good answer. They've headed south to the River Tee, to the town of Middlesbrough. which is also Jade's home town. Here we are. Now, being a Middlesbrough girl, have you been here before? I haven't. I probably should have done. They're here to find out about another local hero. -Welcome to the Dorman Museum. and I'm going to show you our Christopher Dresser Collection. he'll forever be associated with Boro. in different museums. In New York, in Europe. that you can go and see in the world. And was a huge and lasting influence on 20th-century design. than his contemporary William Morris. I have heard of him, but I don't know a great deal about him. to promote kind of positive things coming from Middlesbrough. I think where I can I try and help that, too, with sports. and American competitors in the field of design. from which Dresser was an outstanding early graduate. What sort of things would he have studied there? doctorate from the University in Jena. but he chose a more lucrative career path. to do design when he was just a student. People like Minton and Coalbrookdale and Wedgwood. mass-produced goods of high quality. which was the way forward. His metalwork looks like it was designed in the 1970s. "This looks so Art Nouveau and Art Deco." And I'm like, "This is 1860s." You can see what a pioneer of design and the man was. with the Victorian natural design, because he was so forward-thinking. the London International Exhibition in 1885.
and it was selling off the shelves. He was very innovative as well. with spray painting pots as well. and seeing the barber spraying people's hair. I really, really like that colour. So where did he get the influence for these designs? he went on one of his dreams. which has never been heard of before. he was invited to ceremonies. and you can see it in the pieces when he came back. and that was revolutionary at the time. by opening a store to sell his designs. working with Liberty of London. This is the Kordofan candlestick. And this was designed exclusively for sale at Liberty's of London. you would say it was designed yesterday. credits Dresser with being one of his biggest influences. and it's still produced today by Italian designers Alessi. And something they're almost certain not to find in the next shop. Now, what about Tanni and her commoner? or a start line in the Olympics? -I'm going to guess the House of Lords. What you do matters to people. to me, but nobody lives or dies, you know? So we've done Dame, we've done Baroness, what's the next one up? -That's it, for me, really. Unless I marry a Duke, I'm kind of done with the titles, really. And what does your husband think about that? -Is he happy with that or is he...? to tick off on our north-east tour. Come on then, boss, you go first. -The young Stan Laurel lived here as well. -Philip. Hi, good to see you, my love. Ah, we've definitely been here before. Tanni likes her glass, so maybe this is the place. -If you want to get ahead, get a hat. -Yeah. So, this is a ship's light. -I think it's early part of the 20th century. it's been there for some long time. -That's just in the window in the sun. -We haven't had any sun! -Hats off to you, Phil. -Right, so what do you reckon about this, then? Now, that's what a Baroness should look like. -I think I should wear this all the time. -It's got a certain dignity to it. It would be nice if it was real. -Who's the expert around here? -But if you pick that blue vase up, there. and Maling's is a porcelain company that worked in Newcastle. So that's a local pot. Tell me if I'm right or wrong. -That's the tea supplier, Tanni. It says "Maling Ware" in the small print. -That's really pretty. I like that colour. -Was she blue and white? she used to scoop out the tea leaves. Let's have another look at it. This is... This is a tea caddy. For Ringtons Ltd. They were Newcastle-on-Tyne, and it is Maling Ware. -OK. Will it help us win? and I think you kind of like that. -I like the miner's lamps. She's on the money, this girl. Makes choosing your favourite a bit easier. ..could be written on the back of a very small postage stamp. I want you to hold that there and look at it. This supposedly has been down a mine. -And that looks a bit sort of more used. I mean, I'm sort of... I quite like that one. -And you'll never guess the price. what they can do them for, haven't we? -How are you, my love, all right? What's the best you can do on the bit of Maling's? That's easy. That could be £10. OK. What's the best you can do on the miner's lamp? -..and I'm hardly making anything here. I could do 45. -Can we have the two for 50 quid? Because it's Tanni, I want her to get something nice. -So could we have those two for 50? -£50, thank you very much. -Lovely to meet you both. -Thank you. You take care, now. Cheers. Quite a team, those two. I tell you what, you're good in that. Have you ever thought about racing it? Do you know, I should give it a go, shouldn't I? You should, you'd be quite good, I think. 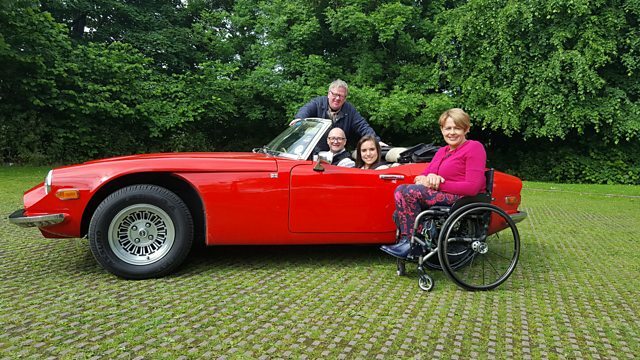 Now, with shopping done for the day, Tanni and Jade are back together. And have our experts inspired confidence? What we needed to find out is what's the biggest losing team ever? And try and beat that. So we're not the biggest losing team ever. That could be our joint goal. Now, this is more like open top weather. -What do you think to the car, then? -Oh, she's a little baby, actually. There is something about the roar of a British sports car, isn't there? You know what, it doesn't even have to go very quickly, does it? -No, which is a good job. -What was the open-top car like? -My hair was a mess. -I couldn't see a thing the whole way. I am so happy that your hair was a mess! -Shouldn't every chair have cupboards? -Every chair should have cupboards. ..meaning they still have £350 to spend. some leaded lights, a metal cabinet, and a railway sign - as you do. Leaving £275 in their wallet for today. -How did it go for you? -It's just really weird what people buy. And it would never have squeezed into the TVR. -Come on, you two, are you just chatting? Well, you know what it's like. -We're having a jolly good time. -We've got shopping to do! a little village in Northumberland. Not a lot here, but it does have a corner shop. -What a fantastic place, Graham. Good thing they've still got a bob or two to spend. So, tell me what you like. Let's get to see your taste. I like... I like this. -Ah, OK, tell me what you like in that? The way the light shines off it, is what I like. -I just like the shape of it. because it is truly a thing of absolute delight. -And be careful when you tip it over. Now, just as you're handling it, of course, stoppers can fall out. the stopper, so go on, give it a twist and pull it out. I mean, it looks like there's been no nibbles there. -Look along the rim. It's seen no wild parties, has it? tip it over, it will fall out. one and a half twists generally does it. -So I'm going to now risk it. Put your hand out. -So that's a nice tight-fitting stopper. What's it priced at? 70 quid. I mean, it's no money, but in auction it's going to be 20 or £30. How about our other athlete and expert combo? If you were to pick an event for me, what would you choose? Tanni, you're laughing. I don't think it's very funny. Could you please concentrate when I'm talking to you, Tanni? Good luck with that, Phil. The pair are off to the River Tyne and Gateshead. thanks to the likes of Messrs Foster and Cram. -Right, let's have a look. -Hiya. Welcome to McCartney's Yard. -You've got a lot here, haven't we? Well, at least David asked Jade what she liked. I can't see Tanni finding a lot of fine glass in this establishment. So, how old does it have to be? I'm guessing all this is too new. Well, antique is almost as old as me. where something's not an antique today, but it is tomorrow. Not something that's ever bothered our Phil too much, mind you. -These are cowls off a roof. And they're air vents. They're 150 quid. -Is that a bit steep? I mean, I think they're worth £40, £50. -Don't think there's much age to them. -So that's pretty much zero age, there. -I like the little one. -Let me go and have a look at that one. I'd like one in my garden. But is it going to make money? Spoken like a serial winner. That will look nice with some nice flowers in. It's an old feed trough, isn't it? people are now using them as garden ornaments. is about 1,000 years old. It sends shivers down the back of my spine. Yes, but what are you going to actually buy? Paperweights. They're good, aren't they? Apparently this one was made in Sunderland. -That's a bit more like it. Might be one to show to David. of getting Graham to recommend something. This has just come in, David, which is quite interesting. -With a sterling silver rim and crest. -Which is not unusual in itself. and it's been engraved across the top there "Ellen Terry". She became a top actress in the Victorian period. -OK. I've never heard of her, I've got to say. Yeah, she was really quite famous, David. you could have that for £180. But, you know, I think, to the right collector, that's an unusual piece. You seem reasonably confident, bearing in mind it's not your money. -There's no such thing as a fixed price in this business. As Tanni is fast finding out. It's been a really good experience. I've learnt lots. is whatever the price says, it's always negotiable. -As our expert will now demonstrate. -Now, Debbie, have a seat. There's three things that Tanni likes. I like the trough with the bars. And then there's this one here as well. -Let's start here. What's the best you can do on that? -Have I ever told you how sad my life is? -He has to work with me! -Dragged up through the streets of Worcester. -Family of five, never eating. No roof on the house. Can't afford a car. Have we done the car? I'm wearing out, here. No, you're doing really well. Keep going. I'm not looking. -What else is there? Outside toilet. -Whose side are you on?! -I'm all right with 35! OK. What about the other one? The other trough is 125. Just tell me what the rock bottom you can do on that is? And what about the arbour? -Time to apply some peer pressure. What will Tanni plump for? What you like is totally irrelevant. You're going to buy this just on price alone. -Yeah. I prefer that one, but my head says buy that one. -that I wanted you to buy things that you really liked. -And forget making a profit. -I'd have that in my house. -Shall we buy that, then? -I'll go and tell her. so what will she make of the celebrity beaker? We're going to show you something here. and Graham's going to give you a hard selling job. and she was famous for acting in Shakespeare's plays. she became Dame Ellen Terry, because of her acting. -Are you impressed so far? and it's sort of apt at the moment. to tap into 19th-century celebrity? It would be a fair amount, wouldn't it? -I kind of feel like it would be. I'm going to guess a couple of hundred more than that. Oh, my goodness me. Whose side are you on? -I think that is a bit of a risk, isn't it? -Do you take risks in life? -Yeah, of course you do. But it could lose you the show. Yeah. I think at the same time, it could probably win it. You make a very good point there, Jade. But don't forget your paperweight, either, love. Oh, well, OK. Gosh, OK.
-Tell me why you like it. I think it's really different. I've not seen anything like that before. -OK. Bit of local interest going on. and not very many people actually know that, do they? To you, it would be £85. -I think in an auction it would probably go at 30-50 as an estimate. Yeah, I think... I think we should take a risk. -Do you want to see if we can do a package deal? We might even get a buy-one-get-one-free. Not that sort of place, I don't think. So I've said 180 for this, you could have the two for £240. 240. Yeah, I think we should do it. OK. Do you want to go with them both? No-one can accuse our Jade of being risk-averse. -Are they in safe hands? Meanwhile, Tanni and Phil have her apprentice very much in mind. Here's a loaded question for you. Do you think she's going to be as good as you? -Is that because of the coach? -Oh, it's all the coaching. If she wants it, yeah. She could be very, very, very good. Not at this game though, eh? in the historic Wearside city of Sunderland. where British glass manufacture began. -Hi, I'm Tanni, how are you? -Hi, I'm Keith, pleased to meet you. Keith, Philip. Hi. Nice to see you. Welcome to the National Glass Centre. Thank you. of a certain 7th century Northumbrian abbot. in the world right here in Sunderland. You can still see part of it, now, just across the road here. great books, and actually people. and they taught local people to make glass. and that's the first time anywhere in the UK that glass was being made. really began to take central stage in Sunderland. and three glassworks. All smoking. but we also had all the raw materials that we needed right here. for housing the Great Exhibition of 1851.
of an international industry in glass-making. Time for Tanni to get stuck in. -Thanks for letting me do this. -..the master craftsman at work. -Just put it in the white. the white glass just sticks to the hot glass. You make that look really easy. -How long have you been doing this for? I've been doing it since I left school, for 44 year. This is the traditional style of glass-making. We don't use any moulds. This has been around since the Roman days. and we'll pick up some of the yellow chips. And just snip it there. Now. -It's all right, you can't feel it. -You think you're going to feel it. -You've just got a pile of molten glass in there? Yeah. Exactly. It's just like getting honey out of a jar. -Yeah, you've done very well. Right, then, Tanni, so there we have it. Get hold of this. And then tap the iron. Now, tap it. Bit harder. She finally got that glass she was after. A box ticked for Tanni, eh? and we know David loves his wheels. I'm impressed with the chair that you use, it's incredibly light. -But that's not a racing chair, is it? And the race chair's quite a bit different, actually. And what sort of speeds can you get to? and the fastest guys get up to about 50mph. Which makes it a very exciting spectator sport. And that's why I think cycling is so great. like running, so the crashes and things do make it really exciting. quite close to Hadrian's Wall. And, yes, that's the River Tyne again. -OK, let's see what we can find. Shouldn't be too hard in here, Jade. So, Jade, this is a centre. So every section you see is owned by a different person. Oh, OK. Right, I see, yes. So there's probably, I'm guessing, 20 dealers here? -So it's a collective, which is a great idea. Always nice if the dealer turns up, though. Blinking heck. OK, that's good fun, isn't it? -Well, look at the top. When was decimalisation? You're the intelligent one here. because I can just remember it. I should remember it really well, but I think it was '71. Very good, David. And he was only three! No, I like it. It's cool, isn't it? It's different. Yeah. Got to be 1950s, maybe early '60s. Don't think I've ever actually used one like that. -Who buys them? Is the question. -Yeah. Would you buy it? I don't know what I'd do with it. It looks really cool, but I'm not sure what I'd do with it. -They're very popular in auction. -You're a proper gambler, though, aren't you? I do. Yeah, I think it's good. What does our shopkeeper Steve make of it? It's a great thing, yeah. It's really good value, because you don't have to put money in. You can actually play it without putting any money in. You get that. The downside is you don't win anything. Jade has never, ever played a bandit machine. -Isn't that great, though, isn't it? -I know, it brings back memories, doesn't it? It does bring back memories. Now, we are trying to get a date on it. -Oh, was it '71, something like that? -I think it was '71. Because they had those little rhymes, didn't they? -£1 equals 100 new pennies. 100 new pence to the pound. You give more, you get change. Was that a hit in '71? Well, "Grandad" was, so anything is possible. -I don't own it, but I do know the person that does. -Which is more than they have left. -Might be able to do a little bit. -Do you want to find out? OK. OK, come back to us. OK. Well, what have we got left? I might just pass this over to you now. -You know what you've got. Right. It's very good news. No longer is it 175, it's £150. -One, we don't have 150. Yeah, we kind of wanted it sub 100. -That's just not going to happen. -140 would be pushing it. -Another big hit from 1971. -OK, cards on the table. We have only got 110. So this could go on all day. -Thank you, Steve. Thank you very much indeed. -OK, that's it. We've actually literally blown everything. Yeah, they're definitely the gamblers. to unveil what exactly they've bought. What I want to know is, was this one as competitive as this one? Actually, Jade has shown her true colours. -I wonder where she gets that from, then? I wonder. Show us yours, Phil. -You ready? Just hang on. -I'm a bit nervous about this, actually. -There's a bit of a theme here. -What kind of theme is that, Phil? Kind of Grotbags' skip or what? Hey, wash your mouth out with soap and water! I don't know - what's the theme? What's the theme? We've got a bit of Northern stuff going on here. We got a miner's lamp, we've got a bit of Ringtons, I believe. -An original North Eastern Railway sign. -That's not bad, that's not bad. -I thought that was for nothing. -And that won't be heavy at all, will it? Dead easy to pick up. we thought we'd have a go at this cast-iron pig trough here. Nice, very nice. Yeah, I wonder where you'd put that in your home. -Have you not got one? -I don't know how to value it. -Did you know what that was? No. And I thought those bits were just ready to go to the bin. -I'm not going to lie. -I tell you what, you'd better find yourself a new coach! -OK. Ready? Phil, that's going to make you mad. -I like that! I like that! cos any idiot can make one of those. The Goss. Is anyone collecting that these days? -Apart from Jade and I. And I love the one-armed bandit. -Well, that was our final purchase. Because we have spent every single pound. -I like the horn beaker. Apparently, it was somebody who acted Shakespeare's plays. who later became a dame. Let me stop you there. We don't deal in Dames, right? Unless they're a Baroness, frankly, I'm not interested. -We shall see you at the auction. -All the best to you. -So let's now be candid, shall we? -We have bought some tat, haven't we? -I was quite pleased, and then their stuff looked so nice. They might get us on the budget. We've definitely got better stuff, it's just if we can sell it. -Gold medal or silver medal? -OK, that's good enough for me. they're now on their way to an auction in Yorkshire at Harrogate. -Tanni, you have changed. You've changed. but that House of Lords, it's changed you. I'm on gate duty now, am I? -He's doing all right, isn't he? He doesn't look too impressed, mind. Don't forget to close it, Phil. the great tea and bun destination. And this is Thompson's Auctioneers, a sort of antiques arena. -Very well. Oh, sorry, I didn't say hello to you. -Go on, in we go. whilst Jade and David splashed all of their 400, also on five lots. thinks will prove as tasty as a toasted teacake? strong interest in that. I think that's a winner. The one-armed bandit, I think, is a bit of fun, really. It's portable, just about, so it's not a large item. But does it work, is the question? So, hold or nudge? We'll soon find out. Now, Jade, have you been to an auction before? -Don't mess about, do they? Tanni, have you been to an auction? Not since I was a teenager, so this is quite exciting. -Phil, have you been to an auction? -I did once, but I didn't like it. First up is Tanni's sign. Look, our best lot's up now. My cost is £60. -There's a profit in this. Commissions starts here with me at £120. It's good value at 120. Are we all done? I shall sell at 120. -It's the way we roll, you know? Isn't it? -It's the way we roll. -Well, I hope this is not the way you roll! Already on the back straight. OK, I'm pleased with that. Don't look too impressed, just play it down, play it down. -Yeah, be cool, be cool. -Now for one of Jade's big spends. Will she hit the jackpot? This isn't normal, to double your money all the way. -I don't want you to be too disappointed with me, that's all. -Interest on the book here. -120 in the room. At £120. -Go on! A bit more! -Come on! We need to double our money, Jade! Are we all done? I shall sell. Standing, at £140. -Yeah, not double your money. But not too bad. It wasn't three bells, but it was two cherries. Two cherries? Two cherries will do. You've got other good stuff, though, haven't you? -Our sign was the best. -Excuse me! So have we! We're hoping we're going to have our noses in the trough here, aren't we? You've already had them in with that blinking railway sign. And I can start here with me at £45. 50 anywhere? He's going to double his money again. You look shocked? I'm shocked and horrified. Are we all done at £80? With the gentleman at 80. -I know. So sorry, Jade. -Another great result leaves them hogging the lead. but I didn't think it would kind of go for that. Because Jade was saying we had rubbish. And I think she'd kind of convinced me that I had. -Oh, no, she's still right! Jade's turn - the bargain chair. I think 20 quid profit. -Would be nice, wouldn't it? But I don't think we're in the Serrell territory here. -Commissions start here with me at £30. -When do they go to bigger jumps? Go on. No? 72 here. At £72. 75, well done. -Yeah! I'm happy with that. We shall sell at £75. -See, annoyingly, that deserved that. This is so quick, I can barely keep track. but how much we money we're making or not making. This is the big one, Tanni. If your rivals don't do well with this beaker, the podium beckons. I think we'd in for a bit of a nosebleed here, I'm afraid. Or you could do amazingly well and then you could change of mind. -And then I will, yeah. I will backtrack completely. for Ellen Terry, the famous Victorian Shakespearean actress. Commission starts with me just at £25. 45, 50, 55, 60, 65, 70. 65 here. 65, 70, 75, 80. 110, 120, 130 and 140. -It's still no money at 140. Well, it could have been much worse. Certainly could. They've got away with that a bit. We've got a bit of local social history next. Oh, sorry. Wonderful. Wonderful. Love miner's lamps. -I have a miner's lamp. He always gets bitter when he loses money. Yeah, come on, David. Nothing wrong with a nice lamp though. Commissions starting with me at £30. Two anywhere? 32, 35, 38, 38 with the lady. 40, 42? No. 40 seated here. -Maybe they're back in fashion, I don't know. Can Jade's Sunderland glass help her catch up a bit? this is the one you want to have. Now, this is a unique Tanni Grey-Thompson. Tanni Grey...? It's not a Tanni Grey-Thompson! -It is a Tanni Grey-Thomson. -This is from the Baroness range. -Oh, look. Look, it's up. -The bid is with me at 25. Do I see...? 28 takes it in the room now. Oh, it's a nasty one. -Not to worry. Again, it was a beautiful thing. -I think we'll hang onto ours. Good idea. They don't seem keen. Malings of Newcastle tea caddy. -Was it Ringtons? Ringtons, is it? And quite rare, because they made 48 million of them. and it has Ripon Cathedral on it. -Commission starts here on £18. Are we all done? 20 at the back. -It's a funny old world, isn't it? Disappointed, really, cos we just doubled our money there, didn't we? Now he's just rubbing it in. I'd end up spending more money than I made. that you wanted to buy for more than you wanted to pay for it. and he can do that in a number of ways too. you just nod at them. Most people always nod back at you. -So you leave it till the last, going, "One more?" -I'm not going to nod at all! someone gives her Goss collection a nod or two. Fiver. Five away. Five to the hand, and five. Eight, ten, 12, 15, 18? -Go on! Go on, keep going. On the front at £15. Are we all done? I shall sell at £15. That's done well for them, hasn't it? Yeah, for us, that's really good! It's respectable, is what it is. Jade, don't worry, cos it's not all over yet. These two have got one more item to sell. What did you pay for this one? -Up there with the kids, cutting-edge. -Down there with the kids. -Down there? Is it down there? -Well, up and down with the kids, we are. -And £15 for our steel cupboard and our bits of glass. Yeah, they really took a punt on those. The bid is with me at 20. Oh, well done. I'm so pleased for you. 28 with the lady, it's no money at 28. -30, 32. 30 with you, sir. -Disappointing, Tanni, this, isn't it? Just doubling its money again, you see? -Keep a straight face. Keep a straight face. -This is not normal. You're regretting spending time with me. -Did that just double our money again? cos we're weighed down with money. made a loss of £67.90. So they ended up with £332.10. So, with £492.56, they are the clear victors. -Who got gold and who's got tin. -Jade, we're silver, I'm afraid. We're silver. Not bad for rubbish, was it? -You ready? One, two, three. Fun's almost over. It'll soon be back to the training regime. -It's been a good day, hasn't it? -It's been loads of fun. and have the cassettes to prove it. Do you know what? That was absolutely first class. Top wheelchair Paralympians Tanni Grey-Thompson and Jade Jones do battle in the north east of England. Tanni has a record haul of medals and records, while her promising young protege Jade is just starting out on her athletics career. In the company of experts Phil Serrell and David Harper, the baroness from County Durham and Middlesbrough's Jade are on the lookout for antiques to take to auction in Harrogate. Tanni also tries her hand at traditional glass making and Jade learns about the man who was a design champion of the region.